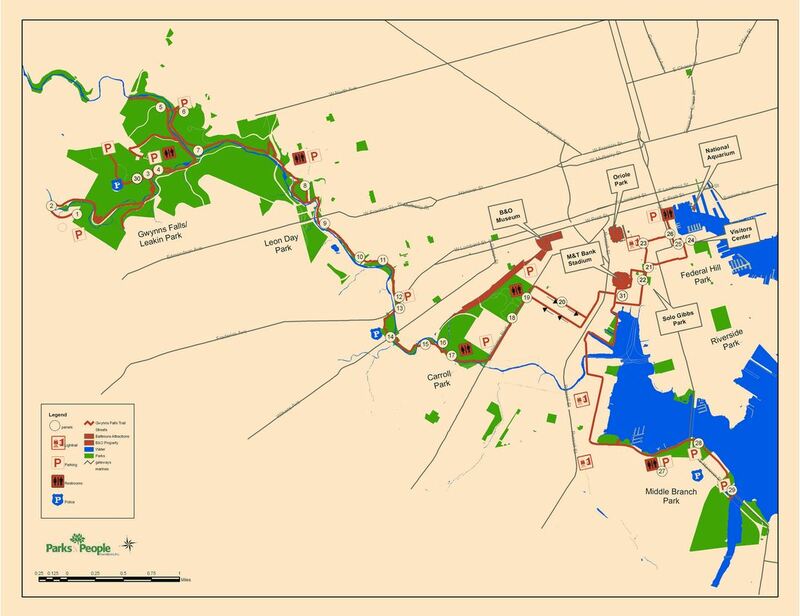 The Gwynns Falls Trail is a 15-mile linear greenway trail connecting over 30 unique neighborhoods and nearly 2000 scenic acres of parkland located in west and southwest Baltimore City to the Inner Harbor and Middle Branch Park. The Trail goes from the eastern terminus of Interstate 70 on the western edge of Baltimore City. The Trail is a great destination providing public access to many recreational, educational, and cultural resources and historic sites. The Trail is available for hiking, biking, running, walking, and skating as well as for fishing, boating, picnicking, enjoying nature and learning about the history of the stream valley greenway. The Trail is Baltimore 's Gateway to the Chesapeake Bay that joins one of the largest urban wilderness parks remaining on the East Coast - Gwynns Falls/Leakin Park - with the Inner Harbor and the Middle Branch of the Patapsco River , a tributary of the Chesapeake Bay. The Trail is also designated as part of the East Coast Greenway. The Trail has nine Trailheads with available parking that provide access points from major roadways. Visit the Gwynns Falls Trail and see the 35 new interpretative wayside panels funded in part by the Chesapeake Bay Gateways Network. The panels highlight the stream valley greenway's cultural history, which includes an old mill race pathway, carriage driveway, Colonial and nineteenth century mansions and estates, ruins of old mills, a mock fort, a waterwheel, a restored pedestrian arch under the oldest continuously used railroad bridge in the United States, and much more. Read more details in a new book titled "The Gwynns Falls - Baltimore Greenway to the Chesapeake Bay". The Trail and associated city parks are open during daylight hours year round. There are no fees for using the Trail or city parks; permit is required for use of pavilions. Trailhead 9 -- Middle Branch Park at Hanover Street, 3200 block South Hanover Street 21225: See harbor views and use fishing piers and nearby Cherry Hill Aquatics Center. Cherry Hill was first noted by Captain John Smith in 1608 for its red clay and later developed as an African American planned community during WWII. Future plans call for the connecting Gwynns Falls Trail south to the BWI and B&A Trail as part of the East Coast Greenway. Winans Meadow Trailhead #2: includes a new 300-person picnic pavilion, amphitheater, restrooms, and nearby Carrie Murray Nature Center. Leon Day Park Trailhead #4: includes new facilities for active recreation, picnicking, and restrooms. Carroll Park Trailhead #6: includes golf course and clubhouse, restrooms, sports courts, skating park, playfields, picnicking, historic Mount Clare Mansion, and nearby the B&O Railroad Museum. Inner Harbor Trailhead #7: includes Baltimore Visitors Center, Science Center, National Aquarium, Maritime Museum, USS Constellation, Baltimore Waterfront Promenade, food, shops, and restrooms. Middle Branch Trailhead #8: including estuary wildlife observation boardwalk. Baltimore Rowing Club, picnicking, boating, water trail, fishing, open fields, restroom, and views of city skyline.